Rnd 3: Working behind petals, ch 3, (sl st between next 2 petals, ch 3) around, join with sl st in first ch of beg ch-3. Fasten off. Rnd 4: Join rose with sc in first ch-3 sp, (ch 1, 5 dc, ch 1, sc) in same ch-3 sp as joining, (sc, ch 1, 5 dc, ch 1, sc) in each remaining ch-3 sp around, join with sl st in first sc. Rnd 8: Join shaded rose with sc in first ch-5 sp, (ch 1, 9 dc, ch 1, sc) in same ch-5 sp as joining, (sc, ch 1, 9 dc, ch 1, sc) in each remaining ch-5 sp around, join with sl st in first sc. Rnd 11: Join yellow with sc in 4th dc of first petal, ch 6, skip next 3 dc, sc in next dc, ch 6, *sc in 4th dc of next petal, ch 6, skip next 3 dc, sc in next dc, ch 6; repeat from * around, join. Fasten off. Rnd 12: Join aqua with sl st in first ch-6 sp, (ch 3, 7 dc) in same ch-6 sp as joining, 8 dc in each remaining ch-6 sp around, join with sl st in top of ch-3. Fasten off. Rnd 13: Join yellow with sc in first st, ch 4, skip next 3 dc, *sc in next dc, ch 4, skip next 3 dc; repeat from * around, join with sl st in first sc. Fasten off. Rnd 14: Join shaded purple with sl st in first ch-4 sp, (ch 3, 4 dc, ch 1) in same ch-4 sp as joining, (5 dc, ch 1) in each remaining ch-4 sp around, join with sl st in top of ch-3. Fasten off. Rnd 15: Join yellow with sc in first ch-1 sp, ch 5, (sc in next ch-1 sp, ch 5) around, join with sl st in first sc. Fasten off. Rnd 16: Join lavender with sl st in first ch-5 sp, (ch 3, 4 dc, ch 1) in same sp as joining, (5 dc, ch 1) in each remaining ch-5 sp around, join with sl st in top of ch-3. Fasten off. Rnd 17: Join yellow with sc in first ch-1 sp, ch 6, (sc in next ch-1 sp, ch 6) around, join with sl st in first sc. Fasten off. Rnd 18: Join shaded purple with sl st in first ch-6 sp, (ch 3, 6 dc, ch 1) in same sp as joining, (7 dc, ch 1) in each remaining ch-6 sp around, join with sl st in top of ch-3. Fasten off. Rnd 19: Join yellow with sl st in first ch-1 sp, (ch 5, dc) in same ch-1 sp as joining, skip next 3 dc, Vst (see Special Stitches) in next dc, skip next 3 dc, *Vst in next ch-1 sp, skip next 3 dc, Vst in next dc, skip next 3 dc; repeat from * around, join with sl st in 3rd ch of ch-5. Fasten off. Rnd 20: Join aqua with sc in ch-2 sp of first Vst, ch 1, shell (see Special Stitches) in ch-2 sp of next Vst, ch 1, *sc in ch-2 sp of next Vst, ch 1, shell in ch-2 sp of next Vst, ch 1; repeat from * around, join with sl st in first sc. Fasten off. Rnd 22: Join yellow with sc in first ch-1 sp of first scallop, (ch 2, sc in next ch-1 sp) 9 times, *sc in first ch-1 sp of next scallop, (ch 2, sc in next ch-1 sp) 9 times; repeat from * around, join. Fasten off. Rnd 23: Join aqua with sc in first ch-2 sp, (ch 2, dc) in same ch-2 sp as joining, (sc, ch 2, dc) in each of next 7 ch-2 sps, sc in next ch-2 sp, *(sc, ch 2, dc) in each of next 8 ch-2 sps, sc in next ch-2 sp; repeat from * around, join with sl st in first sc. Fasten off. 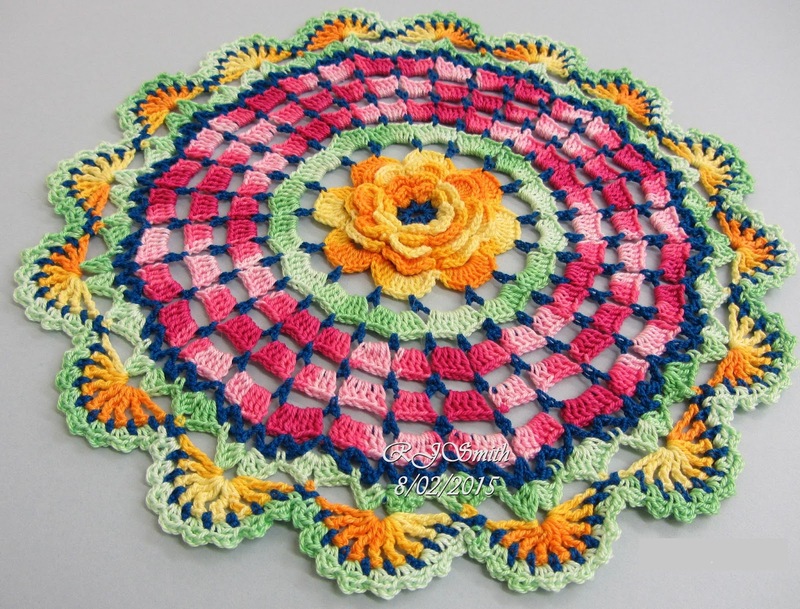 Rosina Smith made this gorgeous doily in yellow, green, blue and pink. This is one I think I will actually make. It is beautiful and for once the directions are easy to follow and understand. Thank you for sharing your amazing talent with others. Thank you so much for sharing these beautiful patterns. I was looking for some to crochet teeny tiny for dolls houses. Can't wait to get started now. Beautiful. I'm going to try this. Beautiful. Loved making this mandala. I love the one made by Rosina Smith. I have been trying to find yellow variegated yarn and crochet thread but am unable to. Icroched Barbie doll clothes and doilies from it. I also can't find it in green ad before either. I would appreciate any help finding it. And if possible have the colors pattern from the one RS made please. 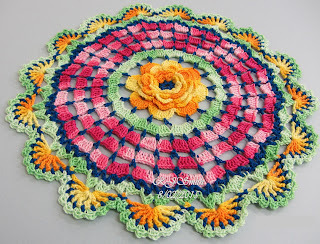 Dank je wel voor het delen van deze mooie mandala! i made this. i loved the pattern. easy to follow. I love this pattern. I started making it already. Can I sell the one I made using this pattern? 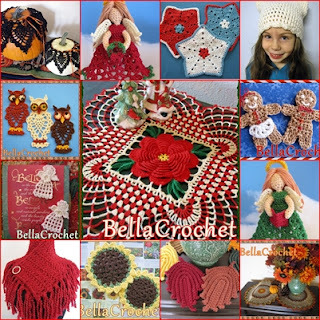 Yes, you can sell items made from any of my patterns, Suma, just not the pattern itself. Good luck!